The Professional Regulation Commission (PRC) on Thursday, December 11, 2014 officially announced that 4,021 out of 8,127 passed the Civil Engineer board exam given by the Board of Civil Engineering in the cities of Manila, Baguio, Cagayan de Oro, Cebu, Davao and Lucena this December 2014. PRC named University of the Philippines - Los Baños (UPLB) as the top performing school with 100 passing percentage or 72 out of 72 passed the exam. 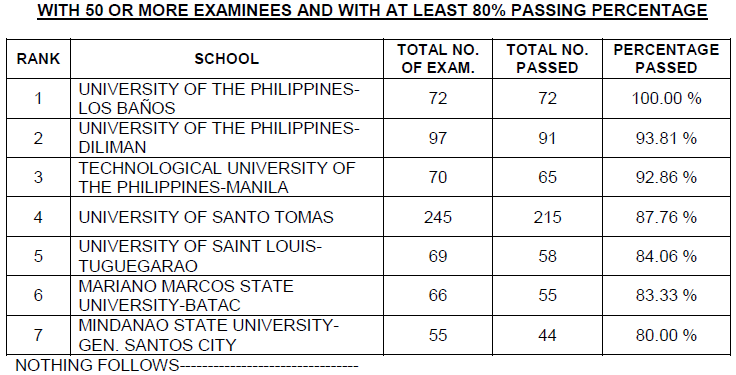 Meanwhile, UP-Diliman ranked second with 93.81 passing rate or 91 out of 97 hurdled the exam.